Peggy Sue's 50's Diner - Good food and a Diner-Saur Park too! If you're driving out to Las Vegas along Interstate 15, and you want a bite to eat, or simply just want to reminisce about Elvis, pull off at Ghost Town Road near Yermo for Peggy Sue's 50s Diner. Peggy Sue's is a very tasty diner decked out all fifties style. The original roadside diner was built in 1954 out of railroad ties and mortar from the nearby Union Pacific Rail yard. Back then it consisted of nine counter stools and only three booths. The current owners, Peggy Sue and her husband, Champ, reopened it in 1987. Peggy Sue worked in the movies while Champ was formerly employed at Knott's Berry Farm. In addition to dishing out great meals, they also showcase their collection of movie memorabilia at the restaurant. The two have expanded the original diner into the tourist stop it is today! Upon entering the diner, you are greeted by Betty Boop, who is ready to seat you. To your left is a gift shop with all sorts of kitschy items and to the right is the restaurant which is covered in pictures, statues, and other things from the fifties. Posters and statues of Marilyn Monroe, Elvis, the Blues Brothers, and Santa on holiday are just some of the items you can find within the restaurant. Menu items include the King Kong Monster Burger, the Marlon Brando Mushroom Cheeseburger, the Buddy Holly Bacon Cheeseburger, Elvis Presley Shakes and Malts, and the Frankie Avalon Philly Steak Sandwich. Other menu items are named after Tina Turner, Richard Nixon, Chubby Checker, the Big Bopper, James Dean, etc. There's also an ice cream parlor, a pizza parlor, and their pun titled Diner-saur Park! The Diner-saur Park has all sorts of giant metal dinosaurs surrounded by ponds, trees, bridges, decks, etc. A giant King Kong statue also lives in the park. Warning signs tell visitors to not feed the dinosaurs. The restaurant is fairly well priced and well worth the stop, if only to look around and take a short break in the free Diner-saur Park. Viewable from the highway are old semi-trailers advertising the diner. Ghost Town Road on the other side of Interstate 15 has the Calico Ghost Town, as well as the Jenny Rose heart sign. Additionally California has other giant Metal Dinosaurs roaming its lands. 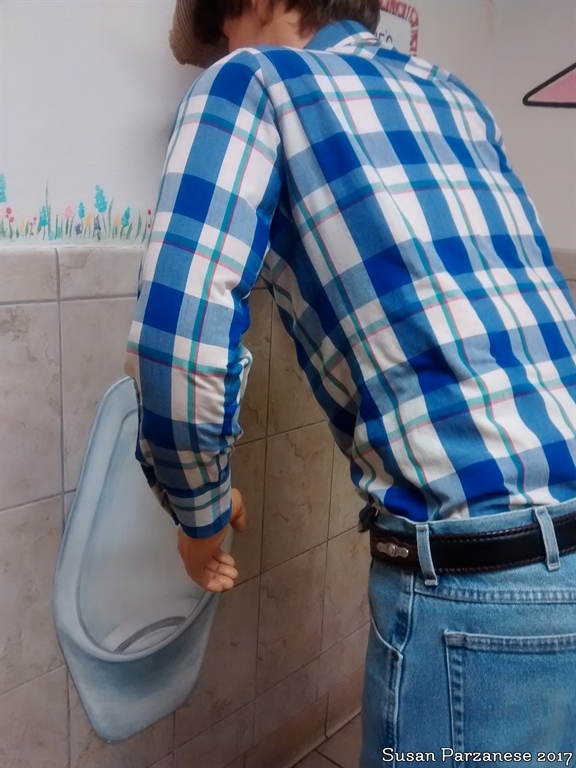 And for women using the restroom at the diner, check out the dummy hanging out in there!